To celebrate Canada's New Food Guide, we're launching our winter recipe collection. There are no hard and fast rules on ingredients, but we care deeply about creating flavour from unprocessed sources. Seems only right to start the recipe ball rolling with soup. 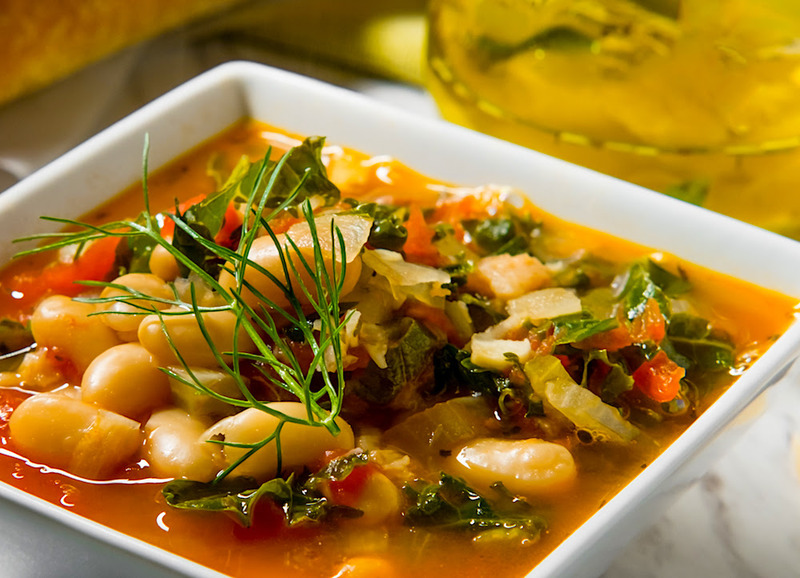 This traditional bread soup is packed with greens, meaty beans, plenty of healthy olive oil and Parmesan, including the rind to infuse a rich, savoury depth to the bowl. And this one's vegetarian, too! Preheat oven to 450°. Heat 1/3 cup olive oil in large Dutch oven. Add onion, carrots, celery, garlic and 1 tsp salt. Cook uncovered until soft but not browned. Cut rind off Parmesan, setting aside. Strain tomatoes from juice, then crush by hand. Set both aside. Rinse and drain canellinni beans. Tear or cut bread into 1-1⁄2 inch pieces. Add tomatoes to Dutch oven and cook 8 to 10 minutes (to carmelize). Then add beans, Parmesan rind (or 1/4 cup grated Parmesan if not using wedge), tomato juice, red pepper flakes, and 4 cups water. Bring to a simmer. Add kale in two batches stirring until wilted.Add about 1/3 of bread and cook, stirring about 5 minutes. Add more salt to taste.Remove from heat. Spread remaining bread on top. Drizzle generously with more olive oil and the rest of grated Parmesan. Transfer to oven and bake 10 to 15 minutes until top is golden brown. Serve in bowls, then drizzle with more olive oil and grated Parmesan.